FILE - Hundreds of people wait in line in August 2015 in the town of Koch in South Sudan to receive food aid. Aid agencies stopped deliveries to Koch in May, after a sharp surge in violence there. 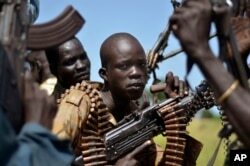 Aid workers in South Sudan have been hit by a surge in violent armed robberies, the United Nations said Monday, condemning the latest attack in which staff of a local charity, Nile Hope, were held at gunpoint as equipment was stolen. Humanitarian agencies reported 32 attempted or successful robberies and looting incidents in October, the U.N. said in a statement, including 15 in the capital, Juba. "Violence and crime against humanitarian organizations in South Sudan are jeopardizing the ability of aid workers to provide assistance at a time when humanitarian needs are greater than ever," the U.N.'s humanitarian coordinator for South Sudan, Eugene Owusu, said in the statement. "This is unacceptable and must stop." A man working for Action Against Hunger was killed during a robbery of the charity's compound in September. He was the 34th aid worker killed in South Sudan since conflict erupted there in December 2013, according to U.N.'s Office for the Coordination of Humanitarian Affairs (OCHA). The world's youngest country descended into civil war when a row between President Salva Kiir and former government deputy Riek Machar escalated into fighting that often ran along ethnic fault lines between Kiir's Dinka and Machar's Nuer people. FILE - South Sudan government soldiers in the town of Koch, Unity state, South Sudan. Kiir and Machar, facing international pressure and the threat of sanctions, signed a peace deal in August but have repeatedly accused each other of ceasefire violations.Deteriorating security in Juba is hampering aid workers’ efforts to assist South Sudan, the U.N. said. Malnutrition is at catastrophic levels, it says, with a risk of famine in some places toward the end of the year. The civil war has displaced more than 2.2 million people, mostly in the northern oil-producing Unity, Jonglei and Upper Nile states, where hunger is most acute. Staff of Nile Hope, a partner to several U.N. agencies, told the Sudan Tribune that six armed men entered their offices on Friday afternoon and forced staff into the restrooms while they stole money, laptops and phones.